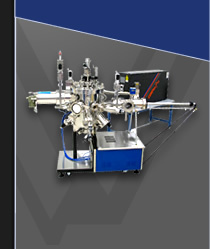 The SVTA Silicon molecular beam epitaxy system has been specifically designed to satisfy the requirement of high quality growth of IV-IV materials and related Silicon semiconductor compounds. It is equipped with electron beam evaporation sources for silicon epitaxy, effusion cells and combines electronic sensor feedback to achieve highly reproducible thin films. The flexibility of the molecular beam epitaxy system configuration enables use of the system for a wide variety of application purposes. The base system consists of two modules: Epitaxy Growth Module and Load Lock/Buffer/Preparation Module. The system comes standard in either a linear or right angle configuration, or a "cluster tool" configuration with a central distribution chamber.